Undoubtedly plastics have played a key role in the shaping of our modern society mainly due to their unique versatile, lightweight and cost-efficient properties. But, unlike other types of materials such as metals, recycling of plastics can be technically challenging. One of the main reasons is the use of different additives and compounds in the plastics to achieve the desired properties. Some of these additives can be originated from unknown sources and could be potentially harmful if they leach in the environment. Regulations restricting hazardous substances in various products have been implemented worldwide over the last decade. This group of regulations—commonly known as Restriction of Hazardous Substances (RoHS) regulations—restricts five main substances: lead (Pb), cadmium (Cd), mercury (Mg), chromium (Cr), and bromine (Br). These elements can potentially be found in a variety of electronic components including PCBs, solder, fire retardant agents, toys, etc. In order to ensure compliance and product safety, manufacturers need techniques and methods to quickly screen for the presence of these restricted hazardous elements. The detections of these substances in the plastics could be a very challenging task requiring the use of wet chemistry and advanced spectroscopic methods. Most of the methods could take time, cost money and require special laboratories. But there is a spectroscopic technique which can provide fast, reliable and cost-effective screening of additives in, X-ray fluorescence (XRF) spectroscopy. One of the main advantages of using the XRF is that it is a non-destructive testing technique which requires no sample preparation or special handling. Handheld XRF guns, in particular, can be used to confirm polymers and plastics in consumer goods and electronics do not contain restricted toxic elements in situ and within minutes. For example, one of the biggest UK Compounder has formulated new batches of recycled polypropylene (PP) and polyethylene (PE). Before launching of the new batches, the compounder has approached Impact Laboratories in order to check that there are no toxic substances within the plastic pellets. Impact Laboratories have used a Bruker XRF S1 TITAN 600 gun in order to analyse the pellets. 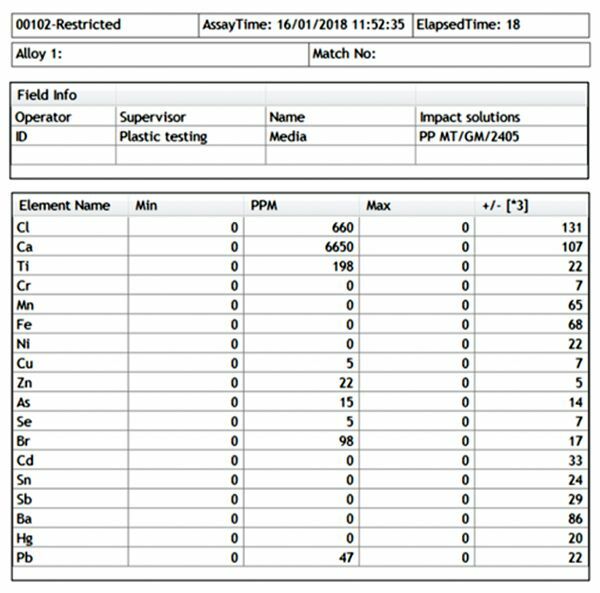 Results from the XRF analysis were printed automatically in a form of a report and revealed that the PP pellets contained 45 ppm (or mg/kg) of lead, 0 ppm of chromium, 0 ppm of cadmium and 98 ppm of bromine (Figure 1). According to international standards shown in Figure 2, the levels of toxic metals found in the PP pellets are within the accepted levels. 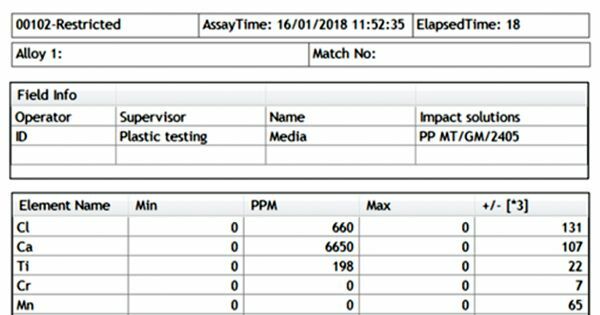 In conclusion, XRF analysis is a very fast reliable and cost-effective method to analyse the plastic materials for any toxic substances following the RohS regulations. Impact Laboratories are equipped with state-of-the-art equipment, such as the XRF, and combined with our highly skilled scientists and engineers we can support you in the characterisation of any products and provide you with a certificate of conformance to any relevant international or local standard.